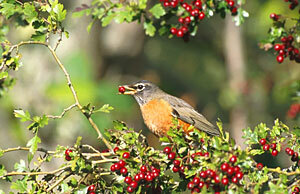 Many birds are friends to the gardener, as they feast on harmful insects and weed seeds. But when they feast on our crops, we categorize them as pests. Blackbirds, starlings, and even robins have been known to pull up tasty corn seedlings, munch on ripening cherries, peaches, and blueberries, and even dig holes in lawns looking for insects. The amount of damage will vary depending on the weather and native food supply that year. In dry years birds will attack many different fruits and vegetables, such as tomatoes and melons, for both food and moisture. For the birds, the timing couldn't be better. As gardeners are planting their crops and nurturing them to ripeness, these birds are raising their young, and need a handy food source. Flocks of birds can quickly decimate an entire berry patch or grain field, while individual birds can be very aggressive and determined to attack a particular crop. Any scare device will work for a few days, but birds are smart and will soon get used to it. Some effective visual scare methods include hanging aluminum pie tins, reflective Mylar tape, or large scare eye balloons (that mimic the scary eyes of predator birds). Noisemakers, such as radios or intermittent canon exploders, are also useful. Commercial bird repellents and homemade hot pepper spray applied to favored fruits are effective, too. However, the best way to control bird damage is through exclusion. Bird netting protects tree fruit and berries if installed 2 to 3 weeks before fruit mature. You can also cover maturing corn ears with paper bags, and lay floating row covers over germinating seedlings to foil the birds.